You’d be forgiven for not noticing, but the top audio interfaces are one of the things that have been steadily getting better. That is, the handful of makers really focused on service musicians (and other audio and audiovisual applications) have improved interface quality, added a lot of features and connectivity, and improved driver performance. MOTU is one of those makers on a short list that I hear good experiences with. But this fall when a press release crossed my desk saying they had more low latency performance, I wanted a bit more detail than the marketing language was offering. So I spoke to MOTU’s Jim Cooper to clarify a bit. TL/DR version: MOTU will give you lower round-trip latency on their latest boxes. iOS, Linux. It does now do USB class compliant operation, so you can use it with iOS (or even Linux, in fact, even though MOTU don’t mention that). Browser mixing. You can access a 48-channel mixer in your Web browser, meaning this does double duty as a mixer – and your computer becomes the interface. Any input, any output. You can route signals in a customizable router, so any input can go to any output. CDM: Can you go into some detail on the new low latency drivers for the UltraLite? Sure! Our new low-latency drivers were years in development. These drivers (and the firmware in the hardware, too) are still actively tweeked and optimized, and we regularly release driver updates to further improve performance. Which hardware is supported? I know MOTU has an integrated driver model, so that means you should see these benefits across the line? What did you do from a technical standpoint to make this work? The short answer is…we started from scratch, spent a lot of time optimizing, looking at profilers, and optimizing some more. We have learned a lot from our 20 years of writing audio drivers and making audio interfaces. Starting from scratch meant that we could fully capitalize on those lessons learned. At the same time, operating systems have improved along with computer hardware. We can now count on machines having multiple cores and supporting Intel-intrinsic (SSE) operations, which helps a lot. Okay, this is the one I’m most keen to know: how does performance compare on Windows versus macOS? It depends on the machine and the software being used. Let’s assume most people have a decent, healthy computer and that we’re talking about USB. For latency performance, we expect both platforms to perform well. Both should be able to do under 3 ms patch-thru or better. That’s like having your head about three feet further from an audio source. For CPU performance, it’s mostly negligible on both platforms. The lower your buffer size, the more CPU we use, which has always been the case. In windows this is generally more true, so there will be a minor difference between platforms. We want to mention that when connected via Thunderbolt, performance is a little better (for both Mac and Windows). Thunderbolt is also slightly more efficient with regard to CPU usage. But the main point is, with these new drivers, USB holds up remarkably well in comparison to Thunderbolt, given common industry perceptions. Yeah, I’m currently spec’ing out PCs with Thunderbolt on. There have been some under-the-hood improvements I know to Windows audio lately. Any you would comment on, or that have implications for your projects? Which improvements are you referring to? Since Vista they’ve had the MMCSS API, which gives DAWs a way to prioritize audio threads over most of the system, which really helps. That helps ASIO drivers quite a bit, too. Kernel drivers still have the limitations of poor timer accuracy and DPC scheduling, which make it more difficult to deliver audio buffers. But we have found ways to address those issues and deliver extremely solid performance. Ed. : Well, we’re a bit behind, honestly, in tracking Windows changes. I hope to remedy that soon, though if you found Vista annoying and PC hardware options lacking then, some of the changes we reported on long ago made to Vista are now also in an OS that’s friendlier and more mature, and I think PC hardware has improved, too. I know there have been some other efforts on Windows audio that we need to keep up to date. And meanwhile on the Mac side, Sierra has fixed some things, too. What should users of the UltraLite mk4 expect in real world usage? A generational improvement in both the driver performance and the overall features and performance of the hardware. On today’s absolute fastest computers, we can achieve full, round-trip monitoring with RTL as low as 1.6 ms with a 32 sample buffer setting at 96 kHz. If you’re running a bunch of effects and tracks, then it’s probably a good idea to bump that up a bit. But even on a good machine (like what most of us have), you can easily achieve 3-4 ms RTL under most practical situations these days. Okay, so you can add low latency features to the other stuff that’s nice on the UltraLite. Meanwhile, MOTU’s 624 and 8A are shipping now. Interestingly, they include both USB3 and Thunderbolt. So if you need a mobile interface to swap between machines and not all of them have Thunderbolt, especially on Windows, you’ve got options. I would note that Thunderbolt is spreading fast on the PC, though. 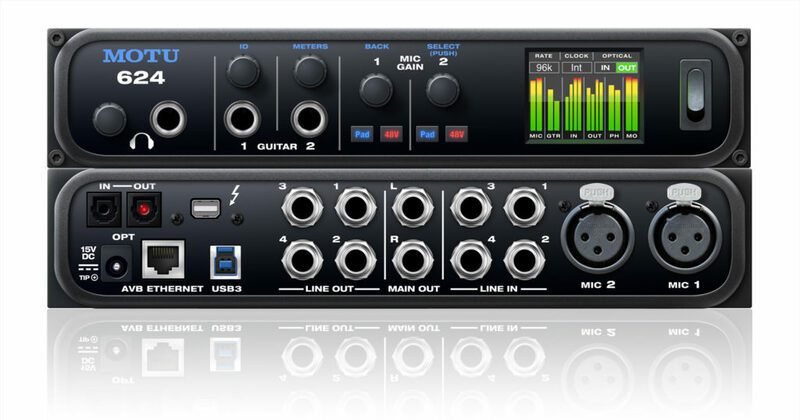 The big deal with the 624 and 8A is that you get 32-34 channels of audio I/O, the ESS Sabre32 DACs with 132 dB dynamic range, and networked capabilities via AVB. I’m guessing AVB isn’t so relevant to most CDM readers, but for those of you needing to combine audio across computers and interfaces, it’s hugely powerful. And like the other recent interfaces including the UltraLite, you get standalone mixing functionality you can access via any Web browser (even on mobile) on a WiFi network. There’s also a suite of analysis tools with FFT, oscilloscopes, and visual analyzers. The AVB stuff on the flagship offerings were nice, but I suspect these could be even bigger – well under a grand, and with I/O that fits a lot of needs.